As a child on family holidays in the ‘60s and ‘70s, I remember the Eyre Peninsula as a dry, dusty and windswept land covered in saltbush and red sand. More recently, I’ve had the opportunity to completely revise my childhood recollections. Named for Edward John Eyre who nearly died several times on his crossing to Albany in 1841, he and his Aboriginal companion, Wylie, were the last of a party of five to make it alive. John Charles Darke was not so lucky, he’s buried near the foot of his namesake peak just SW of Kimba after being killed in a native attack in 1844. From these harsh and foreboding beginnings, the Eyre Peninsula has quietly flourished. Port Lincoln has grown exponentially since the Japanese caught on to the excellent tuna caught and farmed there. Whyalla has always been an iron ore, steel and shipbuilding city and is the third most populous in the state behind Adelaide and Mount Gambier, while Ceduna and Port Augusta form the “bookends” east and west. For an ultra close-up of the Port Lincoln tuna, jump aboard with Matt Waller of Adventure Bay Charters and you can dive into his net full of baby (20kg) Southern Blue Fin tuna and even hand feed them if you’re game. Matt can also offer relaxing day cruises on Boston Bay to visit the local sea lions. You’ll be as surprised as I was at the culinary delights of Coffin Bay. Sit back and enjoy a feed of their famous oysters at The Oysterbeds Seafood Restaurant, grown in the ideal waters just across the road. Pour one of the excellent local wines to match. Ask for a Lincoln Estates Sauvignon Blanc or a Boston Bay Shiraz. If adrenalin experiences are your go, then you’d be hard-pressed to find anything more exciting than a quick dip with the wild Great White Sharks. Calypso Star Charters are in high demand for their shark cruises to Neptune Island, off Port Lincoln. When you’re done with the man-eaters, take a dip with the local sea lions that delight in a game of underwater tag. 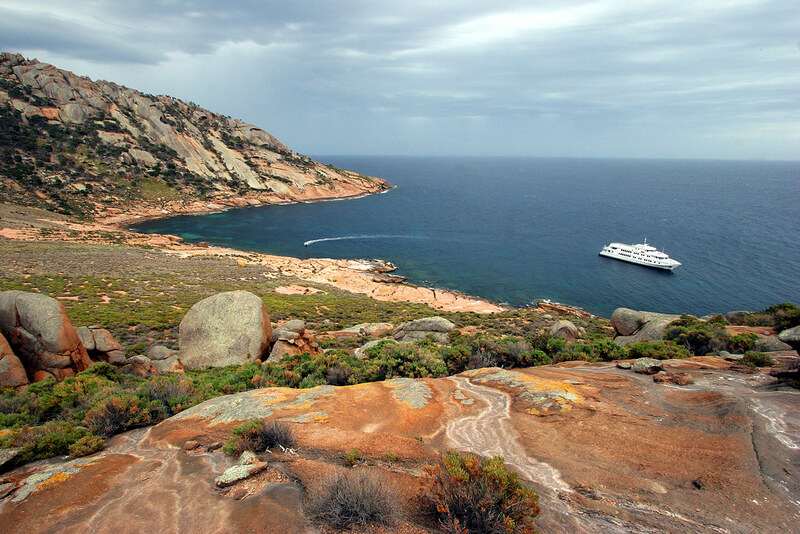 Cruise lovers can take their pick from True North Adventure Cruises’ annual Southern Safari, a luxury food, wine and fun cruise from Adelaide to Ceduna via Kangaroo Island or Classic International Cruises 3- or 4-night “sojourns at sea” aboard the Athena. True North Adventure Cruises visit the remote and uninhabited Investigator Group off the west coast, where you can wander (carefully) among the stunning rock formations and see the rare endemic rock wallaby. Surprise yourself, rediscover the pleasures treasures of the Eyre Peninsula. I did. The coastline of the Peninsula was first mapped by rival explorers Matthew Flinders and Nicolas Baudin in 1801-02. Coffin Bay was not named for a sea burial but after Flinders’ naval buddy, Sir Isaac Coffin.